Who remembers these treasures from the 80’s? I’d like to create something similar for my players… and I’d like to use the AD&D sheets as examples. I’ve got only one of these left for both the Cleric/Druid and Magic-User/Illusionist classes. I’ve got all of the original Multi-class/Bard sheets, which I guess tells you that I favored the Fighter and Thief back then. What do I like about these? There is room for role-playing details like debts and obligations… there’s even a space for your character’s will! Because the class definitions themselves are still in flux, I didn’t want to create class-specific sheets just yet. Instead, I settled on one for spell-casters and one for martial characters. Somebody on the WotC forum suggested using landscape orientation. I like the idea, because it seems that my players are always fighting for vertical space at the table… spreading out is easier. Keep character definition (attributes, skills, class and race features, etc.) on page one and use page two for possessions and notes. I went to a third page for the spellcaster’s spellbook, but for a low-level character it could probably be combined on page two. This is designed to be printed and then filled out with pencil in true tabletop form. Let me know what you think. UPDATE: I’ve expanded my first attempt to 4 record sheets, each specific to a class in our party. These are now based on the 06/07/2013 playtest packet. 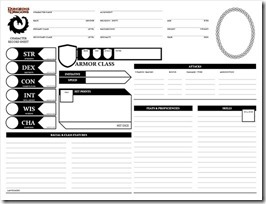 These character sheets are fantastic! I really dig them. Thank you for your work on them. Thank you for putting them in power point format Also,thank you for remembering to make space for the all important character portrait section!